The Norwegian Peacebuilding Resource Centre/Norsk ressurssenter for fredsbygging (NOREF) is a resource centre integrating knowledge and experience to strengthen peacebuilding policy and practice. Established in 2008, it collaborates and promotes collaboration with a wide network of researchers, policymakers and practitioners in Norway and abroad. Safdar Sial has been working with the Islamabad-based research and policy advocacy organisation Pak Institute for Peace Studies (PIPS) as a research analyst since March 2007. His work focuses on conflict, insecurity, and violence in Pakistan and Afghanistan; regional political, strategic and security issues; and media and governance. He has published extensively in national and international journals; is a co-author of Dynamics of Taliban Insurgency in FATA and Radicalization in Pakistan; is the editor of Critical Ideologies: A Debate on Takfeer and Khurooj; and is an associate editor of the PIPS research journal Conflict and Peace Studies. Ahmad, J. 2015. 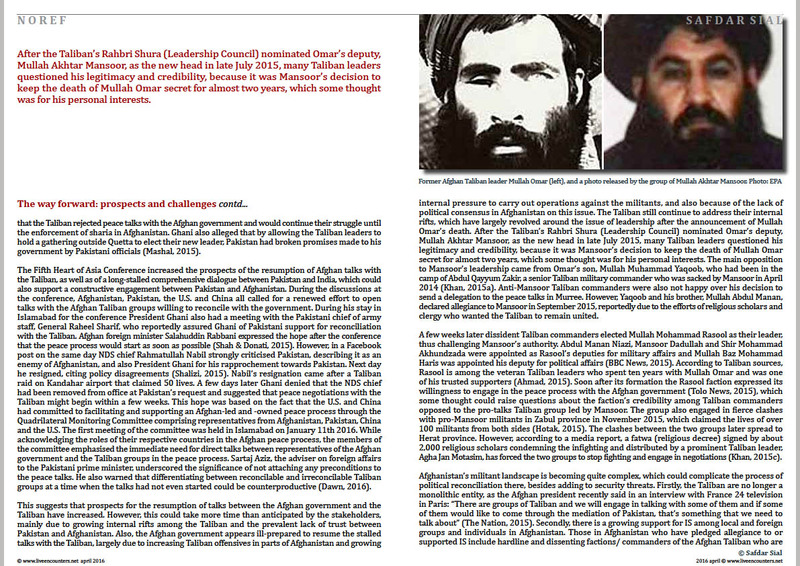 “Afghan Taliban splinter faction picks rival leader.” Reuters, November 2nd. Ali, K. 2015. 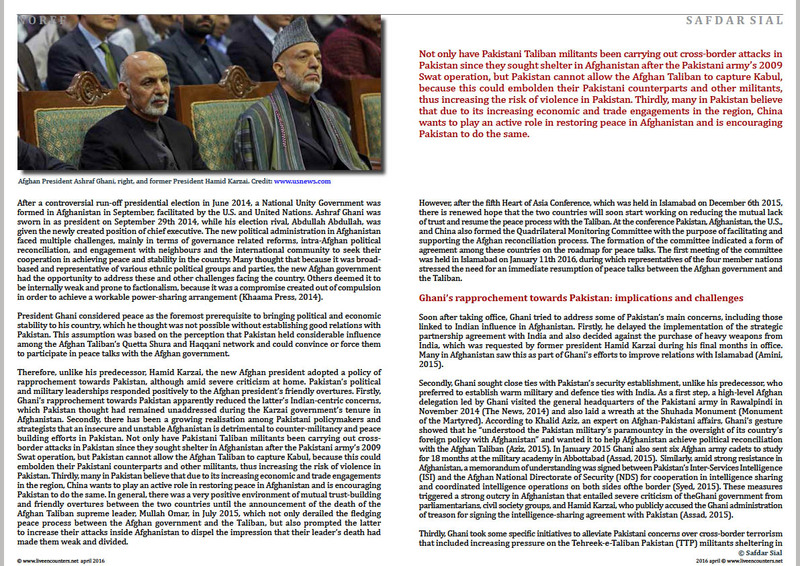 “Sound byte: ‘Taliban talking to Afghan govt under pressure from Pakistan’.” Dawn, July 9th. Aziz, K. 2015. 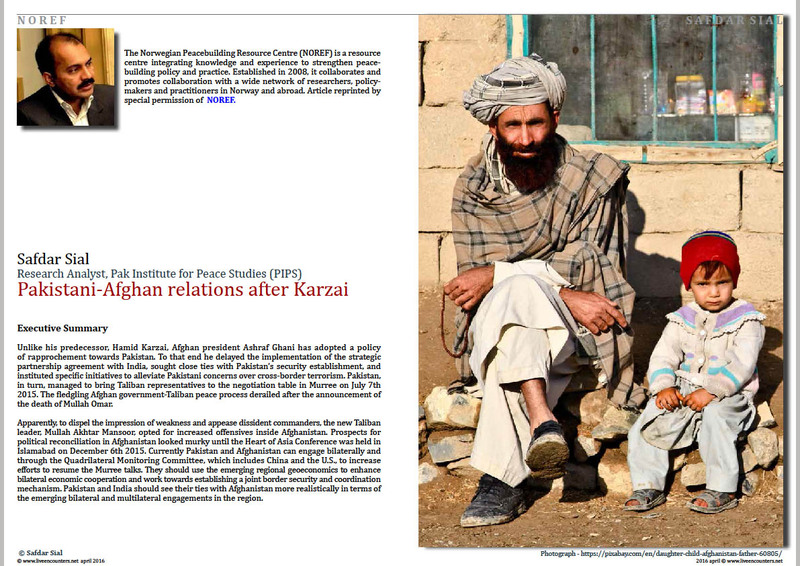 “Pak-Afghan relations: hanging by a thread.”Dawn, September 12th. Daily Express (Urdu). 2015. Islamabad edition. July 17th. Dawn. 2015. 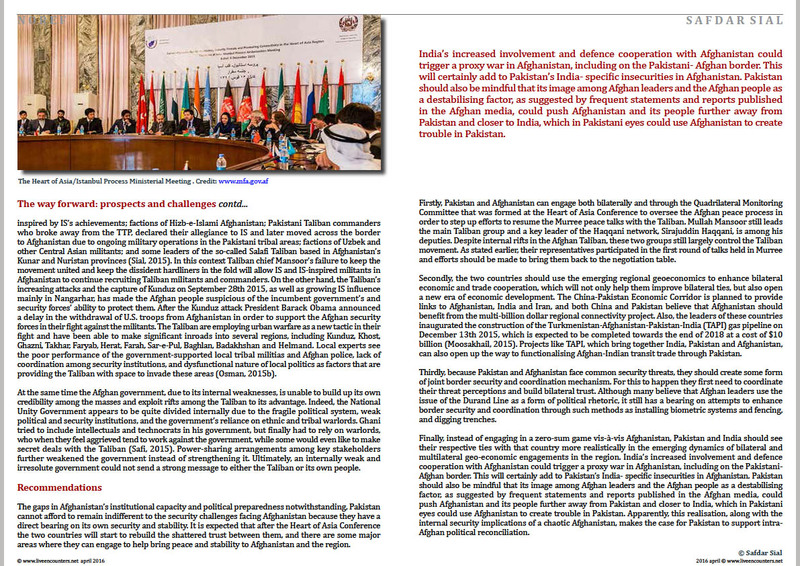 “Key Pakistani-Afghan trade deals stall on India, souring ties.” September 17th. Haider, M. & I. Haider. 2015. 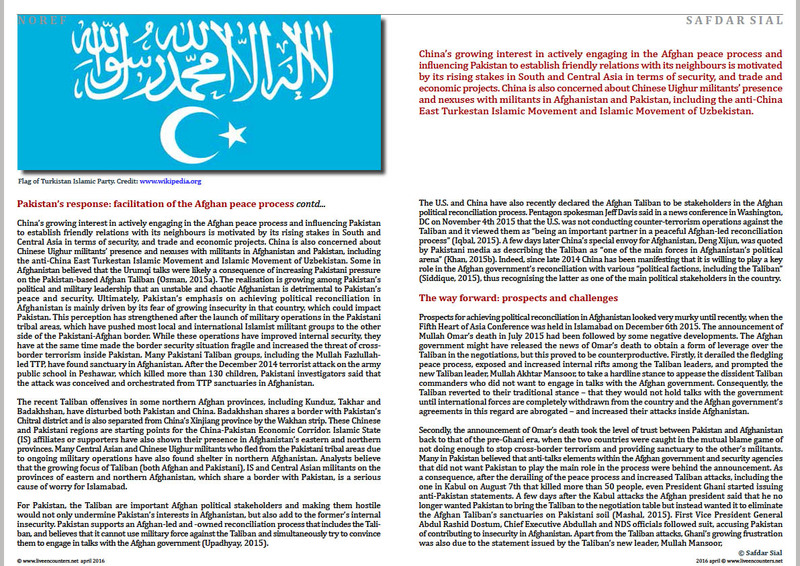 “Nawaz Sharif pledges support in Afghan fight against Taliban.” Dawn, May 12th. Shah, S. & J. Donati. 2015. 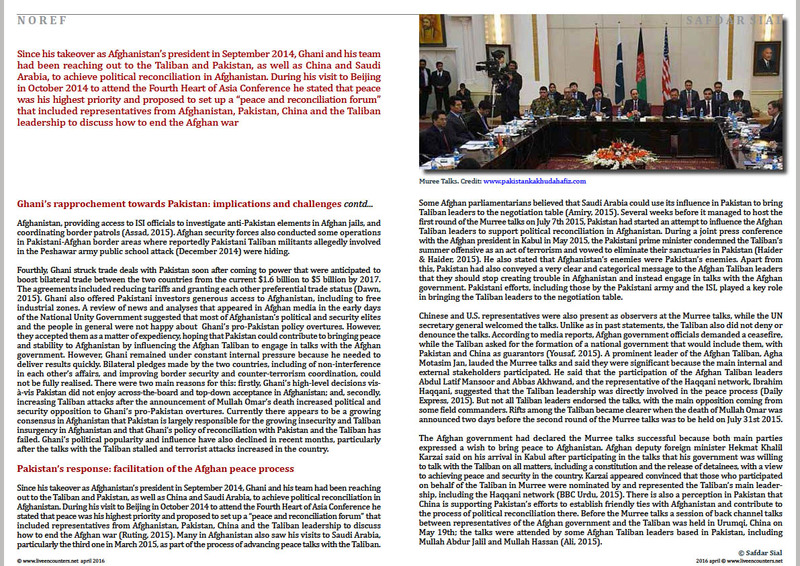 “Afghanistan, Pakistan agree to work to restart peace talks with Taliban.” Wall Street Journal, December 9th.